In March 2012, the company announced that the 2010 edition would be the last printed version. This was announced as a move by the company to adapt to the times and focus on its future using digital distribution. The peak year for the printed encyclopaedia was 1990 when 120,000 sets were sold, but it dropped to 40,000 in 1996. 12,000 sets of the 2010 edition were printed, of which 8,000 had been sold as of 2012[update]. By late April 2012, the remaining copies of the 2010 edition had sold out at Britannica's online store. 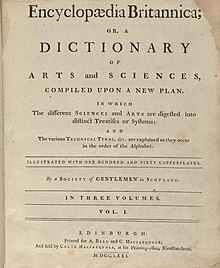 As of 2016[update], a replica of Britannica's 1768 first edition is sold on the online store. Since 1938, Encyclopædia Britannica, Inc. has published annually a Book of the Year covering the past year's events. A given edition of the Book of the Year is named in terms of the year of its publication, though the edition actually covers the events of the previous year. Articles dating back to the 1994 edition are included online. [better source needed] The company also publishes several specialized reference works, such as Shakespeare: The Essential Guide to the Life and Works of the Bard (Wiley, 2006). Britannica Online is a website with more than 120,000 articles and is updated regularly. [not in citation given] It has daily features, updates and links to news reports from The New York Times and the BBC. As of 2009[update], roughly 60% of Encyclopædia Britannica's revenue came from online operations, of which around 15% came from subscriptions to the consumer version of the websites. As of 2006[update], subscriptions were available on a yearly, monthly or weekly basis. Special subscription plans are offered to schools, colleges and libraries; such institutional subscribers constitute an important part of Britannica's business. Beginning in early 2007, the Britannica made articles freely available if they are hyperlinked from an external site. Non-subscribers are served pop-ups and advertising. As of 2007[update] in the fifteenth edition of Britannica, Dale Hoiberg, a sinologist, was listed as Britannica's Senior Vice President and editor-in-chief. Among his predecessors as editors-in-chief were Hugh Chisholm (1902–1924), James Louis Garvin (1926–1932), Franklin Henry Hooper (1932–1938), Walter Yust (1938–1960), Harry Ashmore (1960–1963), Warren E. Preece (1964–1968, 1969–1975), Sir William Haley (1968–1969), Philip W. Goetz (1979–1991), and Robert McHenry (1992–1997). As of 2007[update] Anita Wolff was listed as the Deputy Editor and Theodore Pappas as Executive Editor. Prior Executive Editors include John V. Dodge (1950–1964) and Philip W. Goetz. This page was last edited on 25 April 2019, at 13:10 (UTC).